Although they are often considered a seasonal fruit, cranberries are generally available in frozen and juice forms all year long. 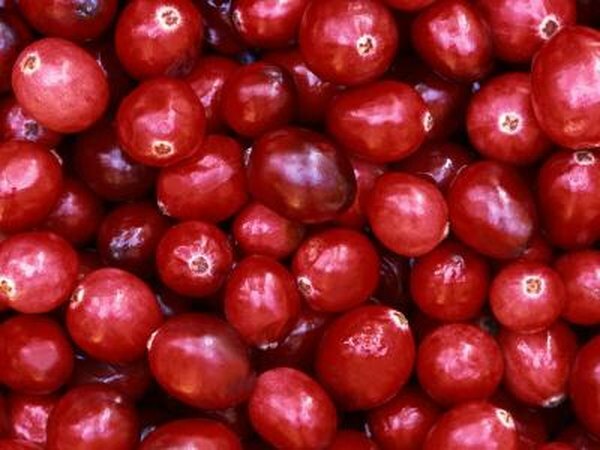 Cranberries have several health benefits including the prevention urinary tract infections. In addition, cranberry juice is an excellent source of antioxidants and is associated with a lower incidence of the bacteria that causes ulcers. Cranberry juice can also be a healthy addition to your weight loss plan. It's less sweet and less acidic than many citrus juices and you can mix it with other beverages to enjoy it in a variety of ways. Have a glass of cranberry juice before breakfast. Remember that skipping breakfast is not a good way to try to lose weight. In fact, going without food in the morning usually leads to eating more calories overall. When you don't have breakfast, your body slows down your metabolism to conserve calories and you're less likely to meet your weight loss goals. Having a full glass of cranberry juice will help you eat fewer calories at breakfast, by filling your stomach before you eat. Drink a glass of cranberry juice before eating lunch. Be sure to drink cranberry juice that does not contain added sugar and if you want to trim more calories, mix half cranberry juice with half water. Avoid drinking sugar-sweetened soft drinks with your meal as they can add 100 or more unnecessary calories, which can cause you to gain weight. Eliminating 200 to 300 calories at each meal by avoiding soft drinks can help you lose a pound or two every week. Include cranberry juice in your plan to stay adequately hydrated. Making sure you get the minimum 64 oz. of fluid daily can help your body maintain your metabolism to burn fat. Mild to moderate dehydration likely won't cause you to require medical help, but it can thwart your weight loss efforts. Even mild dehydration can cause symptoms, such as fatigue and headache, which can prevent you from being physically active. Physical activity is necessary to lose weight in a healthy way and keep it off. Staying hydrated with cranberry juice and water can help you engage in regular exercise without losing momentum. Enjoy an 8 oz. glass of cranberry juice instead of dessert after dinner. Cranberry juice has just a touch of sweetness but less sugar than regular dessert foods like cookies and cake. Additionally, according to a study published in the January 2007 issue of "The Journal of Nutrition," cranberries contain phytochemicals that act as antioxidants. Preliminary evidence suggests that these phytochemicals may help fight and prevent certain kinds of cancer. Having a glass of cranberry juice after dinner, therefore, doesn't simply fill your stomach so you consume less calories, it can provide natural health benefits. Speak with your doctor before making any significant dietary changes.